Learning Without Frontiers is a global platform for disruptive thinkers and practitioners from the education, digital media, technology and entertainment sectors who come together to explore how new disruptive technologies can drive radical efficiencies and improvements in learning whilst providing equality of access. 1. In a school in North West England, out of a class of 36, only 1 pupil stayed in the same house every night of the week. This is a huge insight to have when understanding these young people and has a big impact on all sorts of practical issues such as bringing PE kit in to school and for carting around additional educational devices that the school may have given them – which home is it at? Carl Faulkner, Normanby Primary School, UK. 2. Having pupils creating their own digital content results in more compelling learning experiences. A great example was given by Jenny Ashby, Epsom Primary School, Australia, for learning the alphabet. Pupils created their own pictures and audio for each letter of the alphabet. Then the content was shared with the class with the added interest of knowing who created each piece. She talked about creating a workflow from one iPad App to another, such as Etcha Sketch, Comic Touch, Sonic Pictures and Garageband. Along with other presenters, she had tried and tested the value of using technology that pupils either enjoy at home or aspire to enjoy at home. 3. A wonderful creative maths example was given by Brendan Tangney of Trinity College Dublin, using Google Maps – zoom in on car parks and use them to explain times tables by looking at the grid structures. Hooray for relating learning to real life! He summed the ideal digital learning processes up in 4 words – create, contextualise, collaborate and constructivist – using current creative digital tools anchored in real life contexts with pupils working on tasks in teams to create responses. 4. “MP for a Day” is a game that aids young people’s understanding of Parliament. Peter Stidwill from Parliament’s Education Service described the process that they went through to create this award winning game and I was thrilled to hear about how they regularly engaged end users in the development. He said that user testing was the best part of the process – how ever well you may feel you know a segment, there are always surprises. 5. 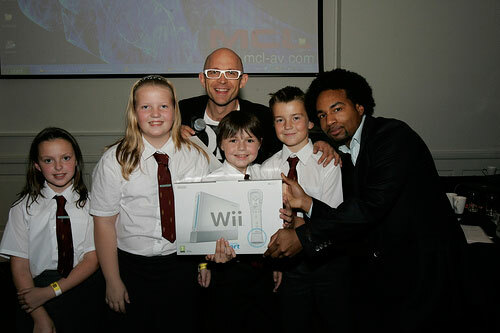 Jason Bradbury of The Gadget Show ran a session where students from a number of schools presented their ideas on digital tools – the competition will be judged in a month’s time. It was amazing to see the range of ideas that came forward. One in particular, was from a group of Bengali students whose parents do not speak English. Their insight was in the parent – teacher relationship where feedback on the pupils was almost impossible due to the language barrier. They designed an App, with Apps for Good that contained some key pre-defined phrases for translation from Bengali to English and back again. They had also tested out the idea with some teachers who had stated that they would pay £2-3 for the App. 6. “…As today’s Generation Y, we are always connected…” Another of the projects showed an English school partnering with a school in Oklahoma working on a pop up school concept. They used social media tools ranging from Ning to generate topics for discussion, to blogging on Tumblr and getting to know their remote team members via Facebook. This project culminated in a guerrilla style stand at a US education conference where the students used Twitter, Twitcam and their Tumblr blog to take the role of journalists documenting news from the conference. 7. I also got the chance to catch up with James Huggins from Made in Me, who create the most enchanting worlds of creativity and learning for 2 – 6 year olds. The interactive picture book functionality is fantastic, for example, changing words in the stories changes the visuals, encouraging not only literacy but creativity. What is really interesting about James’ vision is that rather than being a “digital babysitter” where the child plays on their own, the experience is designed for play by parents with children; preserving the age-old picture book experience, bringing it in to the digital age. 8. “…The job of the teacher now is not to know what to teach students, but to know how to model learning to them…” Jonathan Nalder, Education Queensland, Australia. 9. And finally, a quote from Geoff Stead’s presentation (Tribal Group), where he pleads with decision makers to consider the needs of the end user and their desired experience rather than be persuaded by technology or device-based solutions. “The learner is the traveller, we are tour guides, technology is the vehicle, learning is the destination”. These educators are trail blazing how to use digital tools in a relevant and engaging way. They are collecting proof points of the positive learning experiences that are being created along the way, not only through video feedback from learners, but also through screen grabs and uploaded content. How long will it be until these methods become mainstream? Great information from #LWF11. I am the Oklahoma teacher of the student who Skyped in with the Thomas Tallis students re: #popupschool. I notice your work includes a focus on entrepreneurship with young people. I am currently facilitating an entrepreneurial project with 7th graders. I would value your input and would love to invite you to our classroom via Skype to speak briefly to my students. You can visit our project at http://clelive.edublogs.org/. My email is tammygparks@mac.com. Would love to hear from you!